a good drama keeps one thinking back on it. and this one does it. i never looked back after going thru and didnt even realise episode 1 ended. i just wanted MORE! when i saw Park running in her nun outfit, i just was expecting julie andrews's flying nun. im glad they didnt try that stunt. expecting Park to mess up her scooter and get into an accident. she didnt. that's what made the drama smart. they didnt try to do it all. when they had to go over the top, they would and could. A.N.Jell fan club. awesome. then they see Park in nun outfit. even more super cool and funny. airport dreamscapes. when Park tries to envision the outcome before attempting it. modern meets primitive: Park accidentally turns on the bidet. Jang. 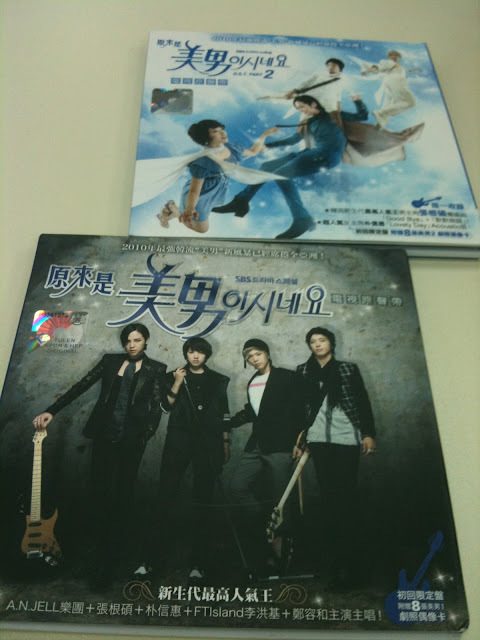 Jang as the rocker star, Jang as the serious musician, Jang as the stuck-up guy. He is just awesome in this role. Park's drunken dream sequence. Her 3 stone statues came to life as the boy band members. i thought about the pig-rabbit operation. while it was necessary and funny, it was oso sad. piggy didnt have a proper nose by the end of the episode, and was dumped back into the store room. the producers kindly omitted all future references to the said piggy so we dont feel the effect so much. if at all. it wouldnt have the same effect, if he had just made a piggy nose out of cloth and then attached it to a toy rabbit. so an operation had to be done. but i hope this is the first and last such op. coolest concept ever: proxy dating @ Myeong Dong, Seoul. the one where Mi Nam (dressed as a girl, of course!) went to see her Mother Superior without letting the others know (some mistake her as having left the group). Shin Woo found out about it, and also that Tae Kyung would be held up from picking her up, so he decided to take her out on a proxy date (and then reveal himself to her and fetch her back). The key to a proxy date is the proxy. in this case, it is the mobile phone. you call her on her mobile to tell her where to find the best Kalguksoo (noodles) shop. then you go there in disguise and eat the same thing as she does, but at another table. when she asks you where she can buy cheap clothing, you recommend a shop, go there ahead of her, tell the salesgirl that you will pay for the things she buys at a fake bargain price. Mi Nam had to buy a set of men's clothes so she can transform back to boy band member and go back to the office, since she left her usual set in Tae Kyung's car. finally, reveal yourself to your date at the end of the day, thereby making her fall for you really really hard. For Shin Woo, he failed not from trying too hard, but just bad timing. cos Tae Kyung got out of his mess and called Mi Nam just when she was about to see him on the crowded street.